In virtually all his films, Tom Cruise does a great job in bringing his character to life. He’s been in some truly good films: Risky Business, Top Gun, The Color of Money, Born on the 4th of July, A Few Good Men. Everything he does reliably brings in a ton of money and big crowds, but Cruise has never received any serious artistic accolades. Never an Oscar in his 34-year career. The thing about Tom Cruise is the differentiation between an “actor” and a “Movie Star”. For whatever reason, Cruise doesn’t fit the profile of an actor. He’s a true movie Star and they’re different breeds of cat. Actors generate “critical acclaim” even if their films flop after two weeks but movie stars always generate enthusiasm, crowds and money. The differentiation between an actor and a Movie Star” is difficult to articulate. In 1964, Supreme Court Justice Potter Stewart grappled with the definition of obscenity. He said he couldn’t define it but he knew it when he saw it. Similarly, moviegoers know a Movie Star when they see one and they embrace him or her, but when they desire to see an actor, they embrace Robert De Niro, Tom Hardy, Brad Cooper or Clive Owens. Tom Cruise’s audience knows a movie star when they see one in the contemporary “Mission Impossible” series, began in 1996 and the current iteration: “Mission Impossible: Rogue Nation”, number five in the series. By history, the original television Mission series began in 1966 and ended in 1973. It originally starred Steven Hill as IM leader Dan Briggs (1966 only). The phrase “Good morning, Mr. Briggs…” began each episode as a tape recording which detailed that week’s task. After a year, Hill, an Orthodox Jew, left in a dispute over working on the Sabbath. Hill went on to star as NYC District Attorney Adam Schiff in “Law & Order” (1990-2000). Beginning in 1967, Peter Graves assumed the role of Jim Phelps, who remained the leader through 1973 for the remainder of the original series. In 1996, the series moved to the big screen with Tom Cruise playing the super-spy Ethan Hunt. Leader Jim Phelps (John Voight) opens the film in similar fashion as the original series with a self-destructing tape, but the character is deleted from the series when found to be traitorous. The original cast members from the 60s were not happy with the film’s portrayal of Phelps and several walked out of the theater before the end of the film. However, the critics were generally kind to the 1996 film. The Mission Impossible series, including the most current iteration, is VERY entertaining and very well photographed. The action sequences rival (but are not quite as good as) the James Bond franchise. Ethan is clearly a clone of Bond, but without Bond’s subtlety and character flaws that make him consistently interesting above and beyond the action sequences. 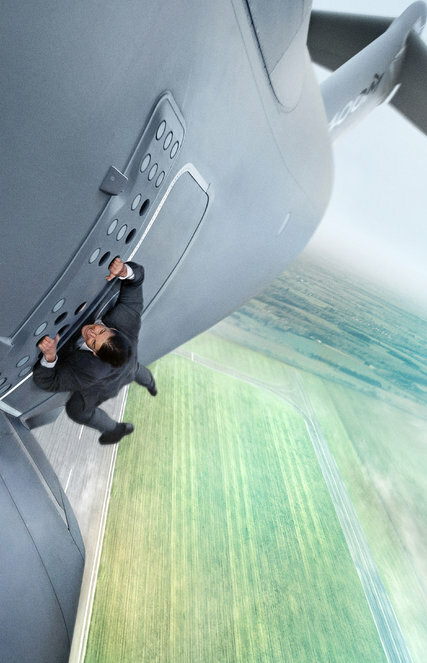 Tom Cruise is famously said to do a number of his own stunts, including riding at speed on a superbike (no helmet) and clinging to the side of an aircraft in “Rogue Nation”. They’re scary, scary fast and these sequences with them appear for all the world to be real, with experts handling them (including Cruise cornering with his knee down in full racing position). The 2015 iteration is very entertaining, the action sequences are excellent and it’s worth the bucks to see it on the big screen. Not out in 3-D which would have been interesting. I give it three and a half of five toothy, windblown Tom Cruise grimaces. Recommended by me if you like action flicks.